Soft binding to University specification; up to 300 pages for your thesis, dissertation or extended essay in only ONE hour, even on submission days! 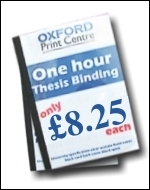 Oxford's leading student thesis binding service. We'll also print out your document for you on our high-speed printers - but you'll need to allow some extra time! Hard binding to library standard. From Oxford, two day normal service, express 24 hour service subject to availability. Cloth buckram with gilt spine titles only £37.00 from your A4 printout, discount for multiple copies. Wide choice of colours, as well as leatherette finish, additional front titling or crests. 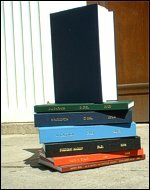 Binding for your family history, memoirs, biography, local history research or special presentation.